Hey Guys, here is one new app with a brand new and innovative concept. And as a promotional method, they have come up with Refer and Earn Program. Well, first let me introduce to this cool app named PlayerZon. You must be playing PUBG Mobile, right? Infact, you are addicted like me, isn’t it? So what if you get paid with cash and rewards on Playing PUBG Mobile? Well, this is what this app offers. PlayerZon is an Ultimate eSports Platform, currently in India which offers rewards on Playing PUBG Mobile. Maybe, in future they will comeup with other Games too. But currently we love PUBG Mobile so let’s earn. So what’s the logic or concept? PlayerZon organizes PUBG Tournaments or Matches Daily and that too lot many in a day. The matches are Free, Paid, etc. You can participate in those matches and get rewards for each kill you score and a huge reward on getting chicken dinner i.e., winning. The best thing about the app is it offers cool rewards and cash on each kill you score even when you get killed at the end. Interesting, huh? And what more? It is offering a Signup Bonus to new users and old users can earn more using the Referral Program. So let’s start. How to Get Signup Bonus in PlayerZon App? 2. Install and Open the App and click on CREATE NEW ACCOUNT Option available at the bottom bar. 3. Enter the asked details such as Full Name, username, Mobile Number, Email and Password. 4. 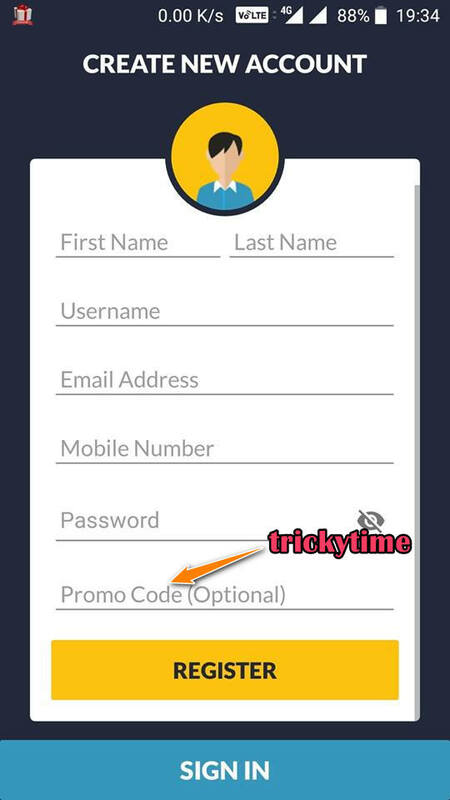 Enter Promo Code as trickytime to get Rs 5 Signup Bonus. 5. Once you finish entering details, click on REGISTER button. 6. That’s it. Once registered successfully, you will be asked to login. So login to the app using your Username and the Password you set while registering. 7. After login, you will be taken to Homepage where you will see list of upcoming PUBG Mobile Tournaments and Matches. You can join the matches you are interested in. 8. As a Signup Bonus, your wallet would have been credited with Rs 5. To check, see on the top right corner. You will see the wallet balance you currently have. Click on it to check the transaction you made. 9. You can add money in your PlayerZon Wallet using Paytm to play more matches and also use the signup bonus. 10. Now refer friends to earn more and then redeem the amount to Paytm Cash. Refer Friends to PlayerZon App and Make them Earn Money Playing PUBG Mobile. Each new user using your Promo Code will get Rs 5 as Signup Bonus and you will get Rs 10 per Refer if the friend you invite plays or joins one Match or Tournament. It’s easy. So let’s start! First of all, Login to the PlayerZon App. Click on Me from bottom menu and select Refer and Earn Option. 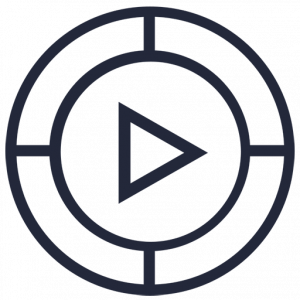 You will see your Unique Promo Code with Refer and Earn Offer Details. Copy the Referral Code and Viral it in Facebook, Whatsapp, etc. Every new friends you refer will get Rs 5 as Signup Bonus and you will get Rs 10 per each referral when they join the first match. Refer more friends to earn more. There is no limit. 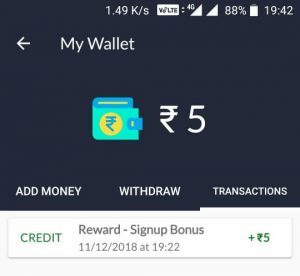 How to Redeem PlayerZon Earnings to Paytm Cash? You can redeem your PlayerZon Wallet Cash to Paytm Cash / Paytm Account. The minimum redemption limit is Rs 50 and it is real easy if you play PUBG Mobile. 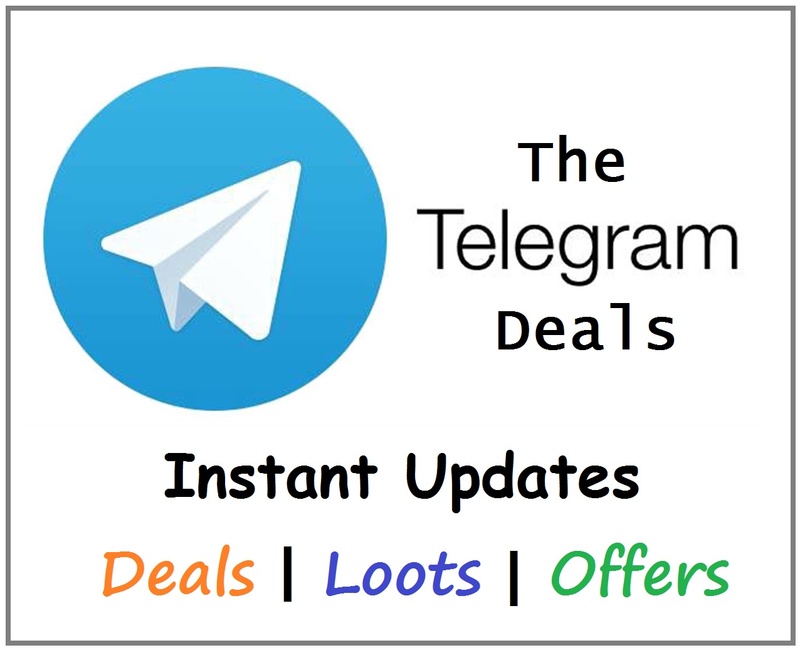 Just refer friends and earn or join PUBG Matches in the app and earn huge. To redeem PlayerZon Earnings to Paytm Cash, just follow the steps below. First of all make sure you have at least Rs 50 in your PlayerZon Wallet. If not, then join upcoming PUBG Matches in PlayerZon App, score some kills and earn this way. Also, refer friends to earn Rs 10 per Referral. Goto Me >> My Wallet >> WITHDRAW. Enter your Paytm Mobile Number in which you want Paytm Cash and enter the Amount you want to Withdraw / Redeem. Click WITHDRAW and that’s it. Redemption request will be processed within 48 hours. Mostly it is done within 24 hours.